08/27/2018 - DOWNLOAD THE COMPLETE PROMO SCHEDULE HERE! The Hershey Bears announced today the club's promotional schedule for the upcoming 2018-19 season. The schedule features an appearance from the Stanley Cup ® , exclusive giveaway items, four Hersheypark Pass Nights, and jersey auctions to raise money for great causes. The complete promotional schedule is available HERE. Additionally, the club has announced details regarding individual ticket sales for the 2018-19 season. Tickets to Hershey’s Sunday, Sept. 30 preseason game at Giant Center versus Wilkes-Barre/Scranton are on sale now. The game will feature general admission seating and all tickets are just $12. Parking will be free that evening. Individual tickets for all regular season home games go on sale to the general public on Wednesday, Sept. 5 at 10 a.m. Fans may purchase tickets at the Box Office, by calling 717-534-3911, or online via Ticketmaster. Season Ticket Holders will receive information regarding an exclusive presale on individual tickets via mail in the coming week. The Bears open the 2018-19 campaign on home ice on Saturday, Oct. 6 vs. the Syracuse Crunch at 7 p.m. That evening is the first of the club's Hersheypark Pass Nights. All fans in attendance will receive a one-day admission to Hersheypark valid through July 31, 2019. Additionally, that evening features a PNC Bank Magnet Schedule giveaway for the first 8,000 fans. In addition to opening night, the club will host three other Hersheypark Pass Nights on Nov. 28, Dec. 21, and Mar. 13. On Sunday, Oct. 7, the Bears will host the Stanley Cup ®, one of the oldest and most revered trophies in professional sports. That evening, the Bears will celebrate the championship win of its NHL affiliate as they hold Washington Capitals Night. The Bears will wear Capitals themed jerseys that will be auctioned off after the game, and all fans will have the opportunity to have their picture taken with the Stanley Cup ® during the course of the evening. The Bears promotional schedule features a strong commitment to giving back to the community with several nights to benefit worthy causes. The CommunityAid Teddy Bear Toss is set for Sunday, Dec. 2. All fans are encouraged to help kids in need by bringing a new teddy bear or stuffed animal to throw on the ice after Hershey’s first goal. 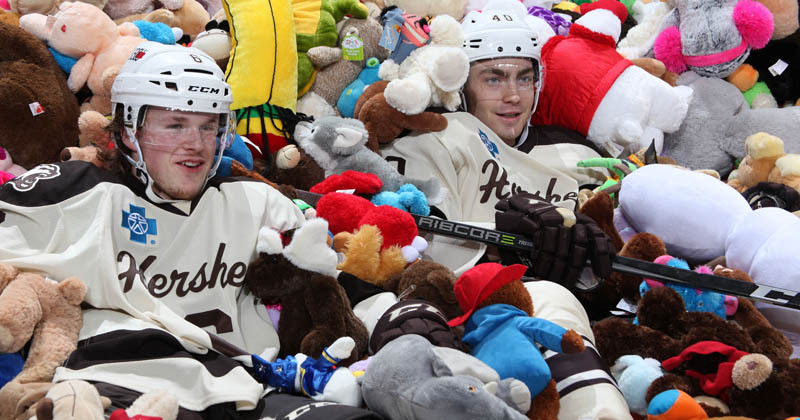 Last year's Teddy Bear Toss saw Hershey collect a club-record 25,017 bears for charity. On Sunday. Nov. 4, the Bears will host Hockey Fights Cancer Night, featuring lavender jerseys that will help raise money for the many impacted by this disease. That evening will also feature a t-shirt giveaway to the first 5,000 fans, courtesy of Penn State Health. The Bears will also host an Autism Acceptance jersey auction on Mar. 16. Among the highlights of the promotional schedule are exciting giveaway items, including Advance Auto Parts Car Flag Night (first 5,000 fans) on Dec. 8, a UGI Fleece Blanket giveaway (first 5,000 fans) on Dec. 22, and returning favorites like PSECU Knit Cap Night (first 4,000 fans) on Jan. 13, and Capital BlueCross Baseball Cap Night (first 5,000 fans) on Feb. 13. Hershey's regular season will conclude on Apr. 14 with Fan Appreciation Night, and the return of the popular Jersey Off Our Back Night. That evening, all fans will have a chance to win a game-worn jersey right off the back of a Hershey player. All promotional nights are subject to change, and events may be added to the schedule prior to the start of the season. For the latest information, visit HersheyBears.com.